This sequel to Slice Fractions does a great job in teaching kids the essence and concept of fractions. This math based app lets kids understand fractions through visuals and activities, and without uttering a word. You can download Slice Fractions 2 app for $3.99 from iTunes App Store. Slice Fractions 2 for iPhone helps kids in the 6-12-year-age group learn fraction concepts without words. It bases its methods on visual representations and manipulatives that improves kids’ conceptual understanding of fractions. They’ll learn the concept without even realizing it. In the game, you got to help Mammoth get his stolen hat back with the support of new creatures that move, multiply and reveal hidden fractions. The activity is designed by researchers at a Canadian university (UQAM). In the game, kids get to solve over 100 unique physics puzzles in 3 colorful worlds. They got to find and collect friendly pets that follow them in their adventure. The fraction concepts taught include Part-whole partitioning, Numerator / Denominator notation, Equivalent fractions, Fraction multiplication, Finding the common denominator, and Fractions bigger than 1. I remember, I had a tough time understanding fractions when I was a kid. I showed the app to my niece, and she picked it up rather quickly. 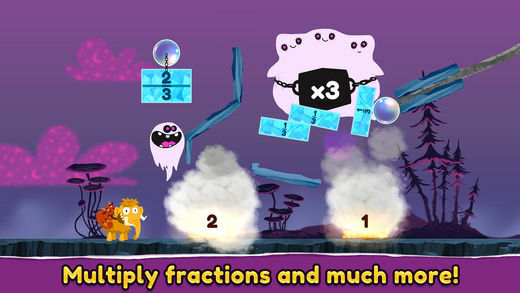 Slice Fractions 2 app for iPhone is based on the following Common Core concepts: (2.G.A.2) (2.G.A.3) (3.NF.A.1) (3.NF.A.3) (4.NF.A.1) (4.NF.B.3) (4.NF.B.4) (5.NF.A.1) (5.NF.B.3). It is complimentary to Slide Fractions. The graphics part is excellent. The animations that show the fractions are gorgeous too. As something is split, the related fraction is shown in an easy to read format. It also teaches fraction multiplication through similar visuals. The app is also available in multiple languages including Danish, French, German, Italian, Japanese, Korean, Norwegian, and Spanish Performance wise, the app is slick and responsive. It requires iOS 8.0 or later. Slice Fractions 2 app for iPhone has similar game mechanics to its predecessor. But the concept is different. The app design is beautiful and easy to follow for children. The graphics and animations are decent. Support for multiple languages comes to the aid of non-English speakers. It would be great if the app also introduce fraction multiplication and all four operations with fractions. It is also stable. Check it out if you got kids who are struggling to learn the concept of fractions.